With the addition of a new bus coupler, the NX-series modular I/O system can now be used on all CJ- and CS-series PLC's, as well as any other controller supporting EtherNet/IP communication. EtherNet/IP uses CIP™ messaging over standard Ethernet infrastructure, providing proven and reliable industrial data communication without having to use special network technologies. 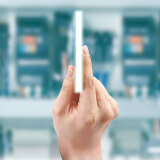 For many years, our CJ2-series PLCs have used integrated EtherNet/IP ports to establish PLC-to-PLC data links. Now, the NX-EIC202 bus coupler adds I/O's on the same cable. With an extensive range of modules, NX-series I/O brings fine-grained modularity, high signal density, and convenient plug-in I/O wiring to CJ2-series PLCs. The current CJ2M-series CPU units can handle up to 32 I/O connections, supporting up to 16 I/O stations with in- and outputs. For more I/O capacity you can step up to the CJ2H-series CPU's, or equip any standard CJ-series CPU with one or more CJ1W-EIP21 communication modules. This will provide up to 256 connections per port, and cycle times down to 0.5 ms. Besides all standard NX-series I/O modules, the EtherNet/IP bus coupler supports the NX-SL3300 Safety controller and Safety I/O's. 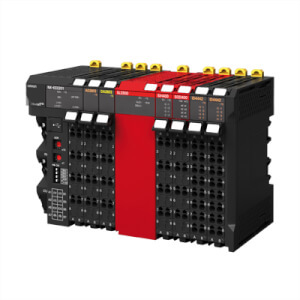 These let you create a modular safety controller within an I/O station, which can be monitored by the standard PLC system. Since the integrated safety system operates independently, changes in standard I/O's and control programs can be made at any time, without affecting your validated and certified safety configuration. Standard I/O configurations will require no configuration; the I/O station can be assembled and operated 'out-of-the-box' if all default settings are acceptable. For personal adjustments or more advanced I/O units like encoder inputs or safety functions, the system is configured over a direct USB connection using Sysmac Studio (full version or limited 'I/O edition' license). This will also provide the I/O size settings for the EtherNet/IP scanner.